We all talk about scenting ability in a dog and scenting conditions, but exactly what is scent? The best definition that I can come up with is: "That quality of something that can be perceived by the olfactory sense." Scent has been compared to fog, smoke or steam in the way that it dissipates. Molecules, in varying numbers, make up scent. These molecules can be alone or attached to microscopic particles. Changes in the environment affect scent and its disbursement. How scent is dispersed is more important to dog handlers than what actually is scent. Air that is cool and moist usually provides good scenting conditions. But rain quickly washes away scent. A strong wind will diffuse scent, spreading it all over making it difficult for a dog to pin its source. However, a soft, gentle breeze wafts scent to a high headed bird dog. The combination of hot, dry air, hard ground and gusty winds result in poor scenting conditions. The green cover in spring and summer makes for more scent in the air and more difficult for a dog to sort through all the scent to pick up the bird trail. Bright, sunshiny days usually do not produce good scenting conditions, either, but when darkness is settling in and the air is cooling rapidly, scenting conditions get worse - which I believe is nature’s way of protecting ground nesting birds. Scenting conditions can be extremely complex to a dog trainer, especially if you have seen your dog find a bird from 15-30 yards away and on other days he seems to run right by the bird. Wind direction and intensity makes a difference in scenting. Strong winds can disperse the scent and make it difficult for tracking. "Whether you are hunting pheasants, grouse or woodcock, basic air movements will affect the performance of your dog and its ability to find birds." 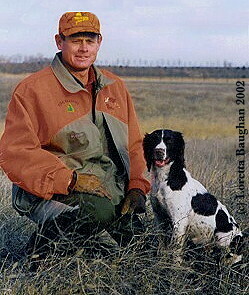 Whether you are hunting pheasants, grouse or woodcock, basic air movements will affect the performance of your dog and its ability to find birds. There is much more to air movement and scenting conditions than just wind direction and speed. There is a definite up-slope and down-slope air movement at ground level. Ground level air movement is caused by heating and cooling of the earth’s surface. Warm air rises, so air moves up-slope as the earth warms. In late afternoon, as the air cools, the ground level air movement is down-slope. If you are hunting with your dog in hills and valleys, hunt the hill tops when the air is warming and hunt the valleys early in the morning or just before sundown to put your dog in the best possible position to use the air movement. There is a big difference in scenting whether the temperature is rising or falling. It is better when rising. If the earth is warmed in a certain spot quickly (south-facing slope), the air in that spot rises rapidly - sometimes creating a scent cone. Higher humidity generally produces stronger scenting conditions. Air movements will carry the odors better when moisture from dew, frost or vegetation is evaporating and the scent will linger longer. A steady rain will wash away bird scent. Dogs seem to smell better just before a rainstorm. When the pressure is dropping, the scent drops to the ground and scenting becomes poor. This makes sense - since when danger is coming, the bird is putting out less scent. There is a chance that this is physiologically true, also. After a front passes and the barometer starts rising, the scenting becomes outstanding. This is because the scent is coming up off the ground. When high pressure is building, the same birds that one could not find are now all over the place and trackable. 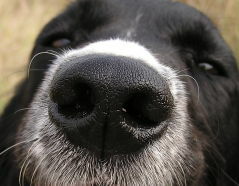 Extremely dry air and heat can evaporate scent and dry out the dog’s nose - as is sometimes the case during a dry autumn. It is important to supply the dog with frequent drinks. Using the wind to whatever advantage we can while hunting with dogs will reward us with no loss of crippled birds as well as more birds found and trailed out.